After some extended time with the Samsung Gear 2 smartwatch, we're ready to tell you what we think. Check out our review for details on this trendy gadget! Samsung made the smartwatch well known. Last year they released the Galaxy Gear smartwatch alongside the Galaxy Note 3. It was a rocky start for Samsung’s entry into the smartwatch world. 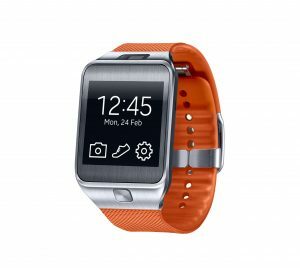 Less than a year later Samsung came out with the Gear 2 smartwatch. They dropped the “Galaxy” since it doesn’t run Android. It runs Tizen OS. So what did we think the second time around? There were some subtle and not so subtle changes to the Gear 2 watch. When you look at it from afar, but once you’re up close you see the changes. You will notice a button right under the display. It’s no longer on the right side of the screen. Also you don’t see the screws on the corners of the screen. The camera has been moved above the display (facing outward) and the microphone has been moved to the right border. It makes the clasp of the Gear 2 a lot lighter and thinner. That’s definitely a great improvement for the overall feel. The band is also removable. The biggest change you’ll see is the addition of a heart rate monitor on the backside of the Gear 2. Right above the heart rate monitor are the little connectors that connect to the charging cradle. Unlike the charger on the Galaxy Gear which wraps around the whole watch, the Gear 2’s charging cradle snaps on the back of the watch. The Gear 2 is still a bit “futuristic” looking but it’s lighter and less in your face than the Galaxy Gear due to the camera being flat on the top border of the watch as opposed to the wristband. 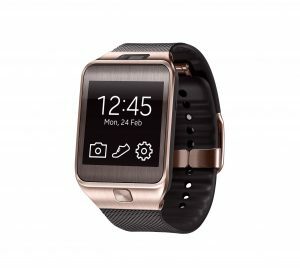 The easiest way to distinguish the Gear 2 from the Galaxy Gear and all other watches is with the squared button below the display. To use the Gear 2 you need a Samsung Galaxy smartphone, or tablet. You have to download the Samsung Gear Manager App from Samsung’s App Store. The Gear Manager App allows you to manage basic settings on your Gear 2. You can download apps for the Gear 2, change the wallpaper, and most importantly manage notifications from apps. Overall Bluetooth pairing between the Gear 2 and the S5 was fairly easy. No trouble there. The Tizen OS that the Gear 2 runs is very similar to Android. It’s hard to even notice a difference. The icons are simple and easy to decipher (they also have a caption under them.) Swiping between screens was smooth. No delay or lag. Some of the gestures work the same as the Galaxy Gear. You swipe downward to go to the previous screen. If you want quick stats from the Gear 2, just double tap the screen. When you do that you see Bluetooth connection, battery life, sound and brightness. The app store for the Gear 2 is still a bit limited but coming along. I didn’t go to crazy on the apps. The most important thing for me was the notifications. You have to be very careful which apps you choose to get notified on, because if your wrist starts buzzing insanely, you will begin to get annoyed at your watch. The Gear 2 has the option of adding music to the watch directly. With a focus on fitness and portability, the Gear 2 allows you to connect a pair of Bluetooth headphones and listen to music straight from the watch. You can even listen from the little speaker (not ideal though, but it works). You can drag music directly on the watch with the Kies program, or you can drag from your music library to your watch using the Gear Manager app. Great for those who find carrying a phone too heavy when going for a run. It’s always fun not having wires in the way when working out, but not having a huge device in the way is even better! You have to be extremely still to measure your heart rate on the Gear 2. It wasn’t such a big feature for me so I forgot about it most of the time. For it to measure your heart rate you have to have top of underside of your wrist. It’s hard to get the hang of it. I couldn’t do it at the gym, when I wanted to measure my heart rate the most. I will keep trying to get it. I didn’t think it could get any easier than having our phones controlling our TVs, but the Gear 2 proved me wrong. The WatchON remote app allows you to control your television and Set-top box. Setup was pretty easy, just like on the phone. I found myself using it a bit more than I thought, I guess because the watch is easy to maneuver. The camera on the Gear 2 isn’t bad for a watch cam. It’s 2 megapixels 720P. The pics automatically go into the gallery on your phone which is pretty cool. You take a pic by clicking the screen. It will try to auto focus and then snap. It makes a shutter noise, so unless it’s very noisy you Never really needed the camera. I used it mostly to take gym selfies (which I won’t be sharing here). As you know, you can answer phone calls from you Samsung Galaxy device right on your Gear 2. Just like the original, the whole talking to your wrist scenario is a bit weird. I used my Gear 2 to answer calls, only a couple of times, when I lost my phone in the black hole (AKA my purse). The speaker on the Gear 2 is surprisingly loud though. The person on the other end heard me clearly, but the mic was so close to me, I figured they would. I thought the Gear 2 would make me look down at my wrist more for the time (as opposed to my phone). I’d get annoyed when the screen was off. There were times when I’d have to do an exaggerated gesture for the display to turn on but for the most part it would turn on for me. It’s definitely an improvement over the Galaxy Gear and it serves its purpose. Overall it does the most out of all the smartwatches out there. You have media, a bit of customization, notifications, and activity tracking. But since it does so much it will also cost more than other watches. The Samsung Gear 2 is currently prices at $299. We might see it drop a bit for the holidays but that may be it. If you have a Samsung phone and need to be discreet most times, then I recommend the watch. If not, you might find it unnecessary and just a nuisance. Overall I do feel that Samsung worked out some of it’s kinks and the Gear 2 to be the right step in wearable tech.